People know that the web is available to anyone with an internet connection and a computer. And people also know that almost anything is possible in the internet. Because of that kind of perception, people expect much from the contents of websites. That is why professional web design matters. Majority of teens are using social media sites like Facebook and Twitter. Looking at the structures of the mentioned sites, one can notice that the design architecture is easy to navigate, and the modules are convenient and a good match for the demands of modern times, like storage of digital pictures/videos and live chatting. Such features are made by the web programmers to make the website enjoyable for the current users, and to encourage non-users to create their accounts in their website. And those are just a few of the benefits of a professional web design. Dwelling deeper into the purpose of a web design, developers keep in mind that a good design doesn’t always mean more colors and more complex art to be implemented within the website. 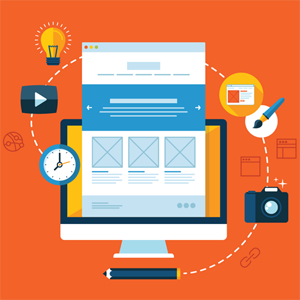 Moreover, developers don’t really aim for a good design, they focus on creating a professional web design. This kind of designing is the key to making a website make a mark on the internet, because a simple yet easy-to-use interface advertises itself to people. There is no need for intense advertising of a website if the developers know that the design is of professional quality. To have a clear example, take a look at Facebook’s login page. Why is it considered a professional web design despite its simplicity? The login details are to be filled up in the upper right corner of the web page, along with the Login button. To create a new account, the signup information fields are clearly visible in the right side of the web page, accompanied by the Register button below. There is not much design, except for an image of networked people on the left side of the web page. The design is considered professional not only because of the clarity of color combos, but also because the website itself is easy to navigate even for newbies. Even after logging in, the buttons which are often needed by the user is found just at the top of the web page, even while scrolling down to view posts of other people. Posts are updated live, and neatly organized at the center of the web page in a dynamic screen ratio. Notification pop-ups are visible on the lower left corner, which is most likely to be seen by users while navigating down the older posts.The web design is also professional in the sense that the administrators of the website keep into consideration the feedback they get from the users. This attitude allows them to cope with the demands of modernization, while making their website more dynamic and efficient as time passes by. Professional web designing, as a whole, entails less of well-organized artistic structuring and more of being dynamic and being easy to use. After all, what good is a beautiful design if navigating the website proves too difficult for users?